Our goal is to raise $5000 for Coral Reef Restoration, Fishermen Training and Scholarships in Indonesia. We are partnering with LINI. 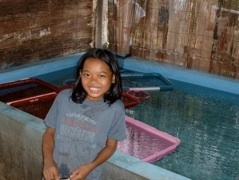 LINI is a non-profit organization based in Bali, Indonesia that is on the forefront of rebuilding Coral Reefs and training fishermen on the correct methods of collecting ornamental fish. They are also actively involved with Aquaculturing ornamental fish and improving the lives of the children of the fishermen through scholarships and commuity outreach. Won't you consider joining our efforts? Your contributions are 100% tax deductible and 100% of your contributions goes towards scholarships and charitable projects. Saltwaterfish.com underwrites all of the administrative expenses of the Foundation and is the largest single contribution source for the Foundation. To contribute, simply click on the link. Thank you.